He has something. Intense and hot fight the simple Laga character and the PX barrels - not to compare with the Talisker DE, a very special drawer. Bottom line, I like the Laga 16 but better than the DE (if I had to choose one for me). That was a lovely one, but there are cons. My bottle is almost finished now and the sweet spot for this bottle is somewhere around 40-50% fill level IMO. The first few drams were a little tough and almost made me regret my decision to buy this. The fruitiness was somehow covered up in the beginning and I cringed at the thought of getting roughly two standard 16 year olds for the same amount of money.. But then there was improvement! I'm really glad it changed in a positive way and I'm a little sad it's almost gone now. It's soft as velvet and drinks way too easy (to no surprise, 43% is on the low side). I really wish they would bottle this at a minimum of 46% without colouring/filtering though. Oh and while we're at it, isn't it a little over the top to charge €30-40 extra for a PX finish? This particularly keeps me from buying another bottle and I think many others share the same thought. Being owned by Diageo, we won't see any changes anytime soon unfortunately. No burn whatsoever on the nose, nice harmony between dark fruits and that classic peated Islay character. A little muted on the first sniff, but it gets sweeter with time in the glass. Smouldering bonfire, peat, smoke, brine, salt, forest soil, moss, grain cereal, yeast, musty basement, pencil shaving, leather, soy sauce, smoked bacon, ham, vanilla, ginger, anise, roasted peanut, almond milk, marzipan, sweet PX sherry, caramel sauce, bitter chocolate, jaffa cake, pastry, overripe banana, stewed apple, orange peel, grapefruit, blood orange, kiwi, sour cherry, raisin and plum. The PX finish on this one adds a substantial oomph! Well integrated sherry, although it naturally tames the peat a little. It's been a while since I've had the standard 16 year old so I can't really make the comparison, but I don't remember the standard one being as fruity as this one. Lovely. Really soft on the palate. More of a focus on the spirit, but still very fruity and similar to the nose. Peat, smoke, bonfire, ash, brine, malted barley, pepper, smoked bacon, rib eye steak, bbq sauce, PX sherry, vanilla, walnut, brown sugar, salted caramel, toffee, chocolate, sour apple, rum soaked raisin and blood orange. Here's where the peat really shines through. As the sweetness is driven to the back it takes a few moments before it shows itself. After holding it in my mouth for some time, a delicious 'peat and sweet' combo has formed. This would pair well with vanilla ice cream or chocolate, great stuff! Medium to long. The taste of bonfire and sugary sweets are lingering. Strong smoke, with associations of bacon and smoked ham, immediately rises from my glass. A fresh sea breeze mixes with seaweed, algae and ash. 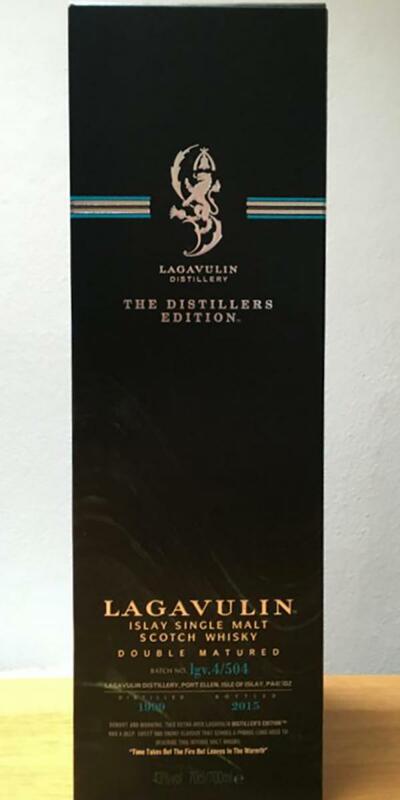 The longer the Lagavulin can breathe, the sweeter and fruity it becomes. Gradually, a complex spectrum of flavors crystallizes out: grapefruit, oranges, light sherry notes (sweet, dark fruits), grapes, vanilla, roasted malt and spicy oak I perceive. The alcohol (43%) is not noticeable. With a beautiful, almost creamy texture, Lagavulin spreads throughout the mouth. An intense sweetness slowly runs down the cheeks, while on the tip of the tongue a subtle Pfeffrigkeit begins and causes a slight tingling. The strong campfire smoke is now fully effective: sweet and strong smoky, the whisky begins to work on the taste buds. Red fruits, oranges, vanilla, roasted aromas, delicate hints of nutcracker chocolate, roasted almonds, maritime notes and spicy oak mingle to create a harmonious interplay. The alcohol is optimally integrated. Mid to long, sweet smoky and warming. An extinguished campfire with cold ashes and salty chocolate provides the aromatic skeleton. Sweet, dark fruits rear up with the last of their strength and mix with spicy notes of wood and a pleasant nuttiness. The Lagavulin leaves a very slight dryness on the palate. Beautifully balanced and elegant, the powerful aromas are slowly coming to an end. My first Laga DE. Found it very different than the 16yo, but very pleasing, especially the long sweet finish. C: Really, it smells like Sauvignon Blanc, and with dry smoke, tastes similar to soft new-make. There must have been some seriously inactive cask[s] involved, or did I get out on the wrong side of bed? Lagavulin character and PX is simple, but great together. Peat, smoke, antique leather, tobacco, orange peel, sherry, salt, bacon and grapefruit. Smoke, tar, orange peel, rum, pepper, salted caramel, forest fruits and earth.